Drummer Bill Bruford may be best-known to some as the meticulous yet ever-grooving drummer behind classic Yes and a number of King Crimson line-ups, but it's been within his own body of work as a leader where he's shown the most growth. More than just a timekeeper with an ability to subdivide complex meters in ways that manage to feel remarkably natural; his own career has exhibited a single-mindedness, a sense of purpose that has continued top evolve over nearly forty years. He may have started out as a progressive rocker, but he's really always been a jazzer at heart, and following his solo workfrom his 1977 debut, Feels Good to Me through to his most recent Earthworks release, Random Acts of Happiness, and his duets with Dutch pianist Michiel Borstlap, documented on the CD Every Step a Dance, Every Word a Songand the DVD In Concert In Holland, there's a clear path. 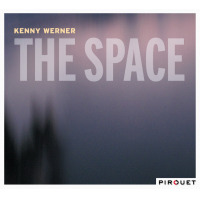 Despite a more relaxed looseness about his playing today, he's still concerned with richer compositional form and detailed arrangements that, while becoming subtler and more organic over the years, have been in evidence from the very start. His first two solo releasesFeels Good to Me and 1979's One of a Kindwere reissued by his newly-created label Winterfold earlier this year and reviewed in a previous article. Winterfold's purpose is to reissue remastered versions of projects released prior to the artificial boundary-line of 1987, when Bruford formed his first Earthworks band and moved in a decidedly more jazz-centric direction. 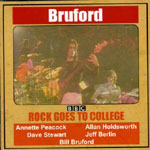 Bruford's first two releases also saw the formation of his band Brufordfeaturing orchestral Hatfield and the North and National Health keyboardist Dave Stewart, gymnastic bassist Jeff Berlin and guitarist Allan Holdsworth, whose distinctive harmonic language was already clear early on in his career. Unfortunately, the mercurial Holdsworth would leave the band following the release of One of a Kind, replaced by a guitarist wryly referred to by Bruford as The 'Unknown' John Clark. Clark, a Holdsworth protégé, was a solid enough replacement, able to execute the often-convoluted themes written by Bruford, Stewart and Berlin. Still, he lacked Holdsworth's distinctive personality, although filling those shoes was a difficult if not impossible challenge, and so even treading the same water was a significant accomplishment. Still, the fact that twenty-five years later Clark's name has essentially disappeared while the others have retained their cachet, if not always major commercial success, speaks volumes. It's also important to note that compositionally it was Bruford and Stewartalone or in collaborationwho really defined the artistic direction of the band, with Berlin a very occasional contributor. 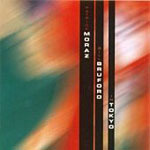 Subsequently, while the band's final two releases1979's live The Bruford Tapes and 1980's studio swan song, Gradually Going Tornadosuffer the loss of Holdsworth's innovative voice, they remain vital and clear links in the chain of Bruford's gradual emergence as bandleader, writer and performer. While the whole being greater than the sum of its parts means that Holdsworth's departure and Clark's recruitment meant a certain shift in the band sound, it was still unequivocally Bruford. 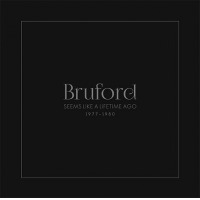 As with all of Bruford's Winterfold and Summerfold reissues, The Bruford Tapes and Gradually Going Tornado come remastered and contain bonus live tracks. Unlike the Summerfold Earthworks Mark I remasters, these additional tracks are decidedly low-fi; still, they serve as a strong indicator of how powerful the group was in performance. Recorded in July, 1979 at a Roslyn, New York club for radio broadcast, The Bruford Tapes shows just how inventive the group could be. Featuring material culled from Feels Good to Me and One of a Kind, they may have wanted for Holdsworth's unique style, but they more than made up for that in sheer energy and a surprising looseness. Despite complex arrangements, this was clearly a playing band, and it's possible that the absence of Holdsworthwhose perfectionist tendencies can sometimes get in the way of his letting loose and surrendering to the musicmay have actually worked to the group's advantage. At this point in his career, Bruford's role is more supportivealbeit in a way that certainly never renders him invisible. But more than his playing, his early albums were notable for his emergence as a writer. And, as he would do in future Earthworks incarnations, he took advantage of the compositional skills of his bandmatesin this case Stewart, whose long-form writing had already defined the sound of Canterbury groups including Egg and Hatfield and the North. Still, with Bruford's signature tight snare drum and dazzling polyrhythmic abilities, he may have been more of a fixed timekeeper for this band than future projects, but what a timekeeper. No other drummer could have approached these pieces with the same élan vital. Listen to earlier Hatfield and the North compositions by Stewart, with Pip Pyle behind the kitthe compositional lineage is clear, but the complexion is entirely different. Clark may be more generic, but he's also more raucous. His contributions to the lithe Bruford/Stewart composition, "Sample and Hold" and Bruford's more ominous "Fainting in Coils," which segues into the obliquely-funky "Back to the Beginning" are filled with a rock and roll fury that more than makes up for his less innovative harmonic sense. Berlin seemed to emerge out of nowhere when he first appeared on Feels Good to Me, although he actually began his career in his native United States backing singers including Esther Phillips and Patti Austin. Berlin was recommended to Bruford by Patrick Moraz, the ex-Yes keyboardist and drummer meeting during the sessions for (still) Yes bassist Chris Squire's leader debut, Fish Out of Water (Atlantic, 1975); but for those not in the know, it was with Bruford that the bassist emerged as a serious contender. Sometimes it's more a matter of timing and luck, but one wonders if Berlina dexterous player with far more than a passing acquaintance to jazz harmonymight have garnered the same attention as fellow fusioners Jaco Pastorius and Stanley Clarke, had the planets been more serendipitously aligned. Certainly his solo on Bruford's "Travels With Myselfand Someone Else" is as fleet-fingered and imaginative as anything his counterparts on the west side of the Atlantic were doing. And his ability to juggle a more conventional bass role with one that found him an equal melodic partner with Stewart and Clark is almost unparalleled. The real treat, though, is Stewart. While his playing with Egg, Hatfield and the North and National Health was never less than uniquely compelling, he had his own perfectionist tendencies to contend with. Here he's more unencumbered, and proves himself to be a remarkably inspired improviser. 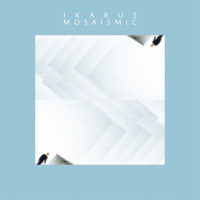 His piano solo over the staggeringly-complicated riff that forms one part of "Sample and Hold" demonstrates, like Berlin, a skill at navigating a constantly-shifting harmonic backdrop that is typically only seen with the best jazz players. And yet, for all Stewart's depth, he completely avoids the kinds of harmonies more typically associated with jazzone reason why he's been sadly overlooked by the jazz intelligentsia. Progressive Rock? 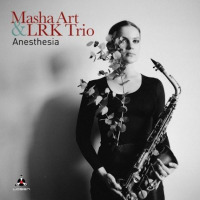 Jazz Fusion? Jazz-Rock? Bruford's 1970s band was all of these things...and none of them. 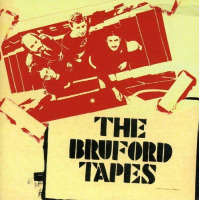 And The Bruford Tapes, with its combination of high volume intensity, detailed long-form writing and reckless improvisational abandon, does nothing to assuage those looking for easy categorization. It is, however, as fine an example as you're apt to find of the kind of unrestricted exploration and cross-pollination once seen on major labels, but now more often relegated to the small independents. For those who are not familiar with the follow-up album, Gradually Going Tornado, the bonus tracka live version of "The Age of Information" from that releasewill come as a big surprise, with Berlin stepping up to the microphone. A sign of the band moving in another directionperhaps a bid for radio playthat some balked at, but one that represented no kind of compromise. 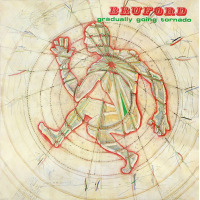 The Bruford Tapes demonstrated a more raucous energy than Bruford's first two releases, but the follow-up studio album, Gradually Going Tornado, proved that the group was capable of generating the same kind of power in the studio. 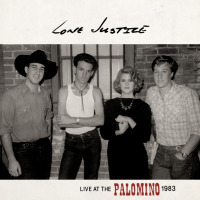 And while Berlin's singing on half of the album's eight tracks may have seemed a concerted bid for greater acceptance, it's important to note that Bruford had already featured vocals on Feels Good to Mealthough the relaxed phrasing of sultry singer Annette Peacock was considerably more artful than Berlin's tighter tenor. The inclusion of vocal tracks might have appeared, on the surface, to be a calculated commercial move rather than an artistic one. Still, the fact is that Bruford and Stewart's writingwhich despite the verse-chorus approach of the vocal tracksretained its harmonic and rhythmic complexities. In that respect Gradually Going Tornado was every bit as progressive as the group's previous albums. Writing around vocals inherently implies a different kind of structure. Episodic writing becomes a challenge when one has to continually return to predefined verse-chorus song form with its inherent hooks. Still, by this point Stewart and Bruford had proved themselves highly creative at working around such restrictions. And while Berlin may not have had the most memorable voiceadequate, but lacking the kind of quality that gives it weightthe fact is he was called upon to execute melodies that would have challenged singers possessing more appealing tone. As was the case in Hatfield and the North, Stewart was absolutely unprepared to concede any harmonic ground for the inclusion of vocals and neither, it would appear was Bruford. The result is melodies that feel a little awkward on first hearing, but feel more natural on repeated exposure. And while tunes like "Plans for J.D." and "The Sliding Floor" veer closer to the rock side of the group's breadth than anything that's come before, there are plenty of twists and turns to keep things interesting. 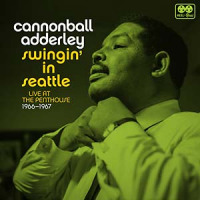 The addition of vocal tracks may have turned off some of the progressive intellectuals, but Gradually Going Tornado also had its share of distinctive instrumentals. Berlin's "Joe Frazier," like Bruford and Stewart's "Sample and Hold" from Feels Good to Me, revolves around a lengthy theme that would test the skills of bassists around the world. Bruford and Stewart's episodic "Q.E.D." would have sounded completely at home in the repertoire of either Hatfield and the North or National Health, featuring Stewart's bell-like electric piano work. Bruford's "Palewell Park" is an uncharacteristic duet, with Stewart's acoustic piano trading off with Berlin's bass throughout its tender changes. Stewart's "Land's End," the ten-minute closer, features wordless vocals by singers Barbara Gaskin and Amanda Parsonslast heard with Hatfield and the North and National Healthand lifts a theme directly from "The Bryden Two-Step," off the latter's Of Queues and Cures. "Lands End," in fact," is demonstrative of just how key Bruford's drumming style was to defining the overall group sound, as it takes on a completely different complexion to Pip Pyle's kit work on the National Health version. 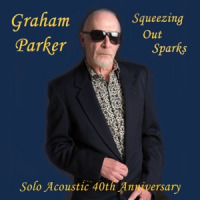 The reissue of Gradually Going Tornado contains a live version of the Berlin/Stewart/Bruford tune "5G" from One of a Kind. While the recording quality isn't the best, it's great to hear a full version, as the take on The Bruford Tapes fades out just when they seem to be getting going. Gradually Going Tornado would be the last recording by the group. It was around this time that Bruford rejoined guitarist Robert Fripp for a new incarnation of King Crimson that would include guitarist Adrian Belew and bassist Tony Levin, so it's uncertain whether it was the commitment to Crimson that signed the deal-knell or lack of commercial interest. Either way the four discs that Bruford recorded in the mid-to-late 1970s served as notice that he had a greater role to play as bandleader, writer and performera role that continues to evolve to this day and shows no sign of slowing down. Personnel: Bill Bruford: drums, percussion, electric chat; Dave Stewart: electric keyboards; Jeff Berlin: electric bass, vocals (10); The 'Unknown' John Clark: electric guitar. 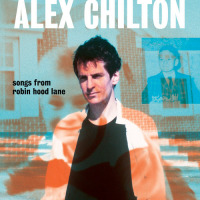 Tracks: Hell's Bells; Sample and Hold; Fainting in Coils; Travels with Myselfand Someone Else; Beelzebub; The Sahara of Snow (Part 1); The Sahara of Snow (Part 2); One of a Kind; 5G; The Age of Information (Bonus Track). 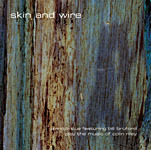 Personnel: Bill Bruford: drums, cymbals; Dave Stewart: keyboards; Jeff Berlin: bass, lead vocals; The 'Unknown' John Clark: guitar; Georgie Born: cello (2); Amanda Parsons: voice (8); Barbara Gaskin: voice (8). Track Listing: The Age of Information; Gothic 17; Joe Frazier; Q.E.D. ; The Sliding Floor; Palewell Park; Plans for J.D. ; Land's End; 5G (Bonus Track).